(Dan Trimmer, 1995). (Arctic Snow X Candor) Tet. 6" Dor. 34" tall, Late. This late blooming gold wire edged near white is a welcome addition to my later garden. The form is full and flower is large. AUGUST FROST makes a wonderful clump with well spaced deep branching and a very high bud count. 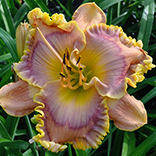 AUGUST FROST was selected due to its combination of August bloom, large size, and hight.